The bandicoot rat has the unfortunate honor of being a targeted meal for two of India's most famous predators: the Indian rock python and mugger crocodile. The hunters? Reptiles. Both found on the floor of the Indian forest. One, an Indian rock python. 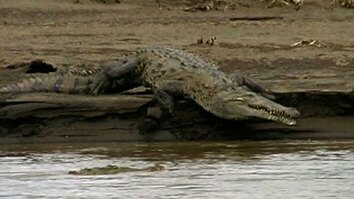 The other, a mugger crocodile. The rodents are bandicoot rats. Topping out at over a foot in length, the bandicoot rat is a scourge of farmers but provides these reptiles with much-needed sustenance. The Indian rock python tracks its prey, relying on heat-sensing pits on the side of its head, and on its sense of smell.—A snake “smells” by “tasting” the air with its tongue, and touching what’s known as a Jacobson’s organ in its mouth. 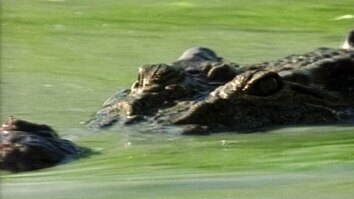 Mugger crocs, on the other hand, choose a place where something tasty might show up and wait…sometimes for hours. And when something does…the mugger springs to life, able to move quickly after its intended victim. Using a powerful, flat tail and webbed hind feet, it is a focused but graceful hunter while in the water…able to dispatch small prey like the bandicoot rat with a quick snap of its powerful jaws. 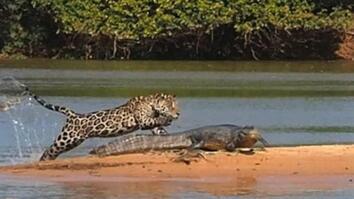 Meanwhile, the python’s persistent tracking has paid off. After grabbing the bandicoot rat with its mouth, the python wraps itself around the prey, suffocating it. It then eats the bandicoot rat whole—unhinging its jaw and stretching its elastic skin to swallow the large animal.